Kick off your St. Patty’s Day festivities a few days early this year at the Canton Regional Chamber’s all things green themed Stir After Hours, hosted by KeyBank. What better way to celebrate the Green Isle’s favorite holiday, then with one of Canton’s most “green” minded financial institutions! KeyBank’s Key4Women networking team, along with Patriot Title and Vito Corleone Italian Grill, will be your hosts for this exciting networking event. Irish eyes are sure to be smiling on the evening with good food by Vito Corleone Italian Grill – serving up dishes that you surely can’t refuse – and music by Nikolina Entertainment. 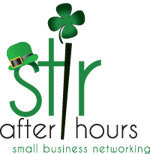 Join us for some Irish fun, networking – and green all around – from 5:30 to 7:30 p.m. on Mar. 15! Don’t forget that one Stir attendee will be selected as our Hot Business of the Month and receive a feature article in May’s Action Newsletter. What better way to reach our 2,800 member contacts than to have your business in the limelight? Register today!